A Donegal based cancer campaign group has welcomed the "firm and steady progress" being made in the construction of the new cross-border Radiotherapy Unit in Derry. Co-operating for Cancer Care NorthWest, CCC(NW) said the Linac treatment machines and CT simulator have been installed and are being commissioned for treatment by the Altnagelvin Hospital physics team. It said the multidisciplinary team is "preparing pathways and protocols to deliver advanced state of the art radiotherapy treatments for patients". Meanwhile, it said just a few of the consultant oncology posts remain to be filled with more interviews due to take place this month. An estimated 400 patients per year from the Donegal catchment area are expected to receive treatment at the unit annually. 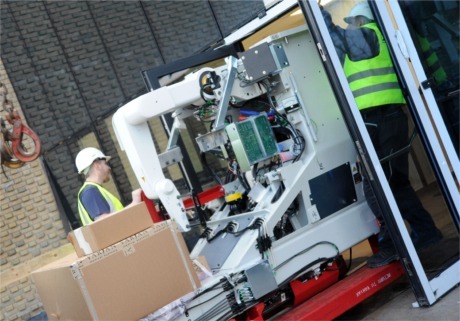 World-standard linear accelerator machines arriving earlier this year for installation at the new cross-border radiotherapy cancer centre at Altnagelvin Hospital, Derry. CCC(NW) said it had read the recent newsletter of the radiotherapy unit project team. It stated that the new service "will increase treatment capacity, improve patient access and shorten travel times for patients from the North West region. "In designing this service we are working with the clinical teams in Letterkenny, Galway and Dublin to advance the delivery of safe seamless services for our patients." The team continued: "The radiotherapy and clinical teams are engaging and working together to agree and enable the safe handover of patients who will require treatment. This work is focusing on: electronic exchange of clinical information; clinical pathways; referrals; clinical documents and discharge letters and OPD letters." A CCC(NW) spokesperson said: "(We) applaud the achievements of the hard work of the project team and continue to wish them well in all their endeavors."